The only kinds of pot-pie I think I ever had as a kid were the frozen ones from the grocery store. I can understand why my mom would opt for this. From scratch, a pot-pie can be a lot of work. The frozen ones cook up pretty quick in the microwave. I confess, those frozen ones are still guilty pleasures for me, from time to time. 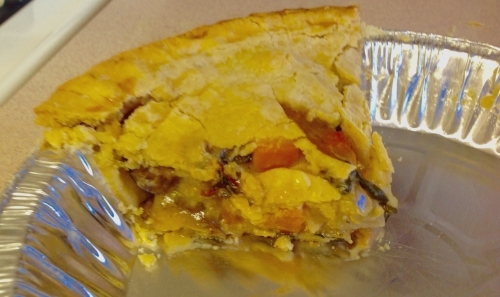 As I started doing more vegetarian cooking, I became intrigued by the idea of a vegetarian version of the pot-pie. How would we create the savory flavors and stew-like filling I wanted, without meat? This recipe, modified from the America's Test Kitchen recipe, hits the mark pretty well. It's got surprising savoriness, and was easier to make than I thought it would be. The original version of this recipe only used a top crust. I like crust on top and bottom of my pot pie, thank you, so that was the first change. I'm also a bit lazy. They make their own pie crust. I can do it, but I don't like to so, I used store bought crusts. Not as good as homemade, but I'd rather have pie than not. I prefer the rolled up dough, where you just thaw and unroll it over a pie plate. The only kind I've been able to find at my local grocery store, recently, is the kind that's already in a foil plate. You either use what you've got, or you go home so, I used those this time around. They come with two crusts per package, so I needed to thaw them and remove one of them from the pie plate for the top crust. You're more than welcome to make your own pie crust, though. Thaw the pie crusts (unless you're using fresh). For the top crust, roll one dough smooth between two pieces of parchment paper. Put it in the refrigerator until needed. For the bottom crust, if using loose dough, gently center one in a 10-inch pie plate, leaving about a 1-inch overhang. If not, just leave it in the provided pan. If there are any cracks, smooth them together with a drop of water and your fingers. Lightly spray the bottom pie crust with cooking spray. (My mom says this helps keep the bottom dough from getting soggy.) Refrigerate until needed. Adjust the oven rack to the middle position and pre-heat the oven to 400 degrees F.
Melt 2 Tbl butter in a Dutch over or other large saucepan over medium heat until the foaming stops. Stir in the onion, mushrooms and 1/2 tsp salt. Cook until the mushrooms release their liquid, about 5 minutes. Stir in the sweet potato and the turnip. Reduce heat to medium-low, cover, and cook until potato and turnip begin to soften, about 8 minutes. Stir in the garlic, lemon zest, and parsley and cook until fragrant, about 30 seconds. Stir in the chard and cook until wilted, about 2 minutes more. Transfer everything to a bowl and set aside. Now to make the roux. Melt the remaining butter in the empty pot over medium-high heat, until it stops foaming. Stir in the flour and cook for one minute. Gradually whisk in the broth, scraping up any browned bits from the bottom of the pan. Bring to a simmer and cook until it starts to thicken, about 1 to 2 minutes. Off the heat, whisk in the Parmesan, lemon juice, and 1/2 tsp salt. 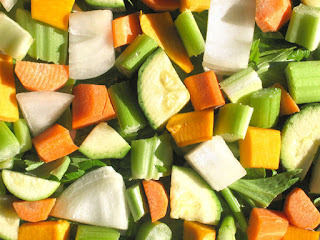 Stir in the reserved vegetables, along with any juice that's accumulated in the bottom of the bowl. Season with salt and pepper to taste. Line a rimmed baking sheet with aluminum foil and place the prepared bottom pie crust/plate in the center. This will help keep your oven clean in case the filling boils-over, ease clean up, and makes it easier to put the pie in the oven if you happen to be using a foil pie plate. Transfer the vegetable mixture into the bottom crust of the pie, and smooth the top. Place the top crust on top. Fold up the bottom edge of the dough around the top dough, and crimp together. Cut four 2-inch slits in the top, with a paring knife, to vent the steam. Lightly beat egg and water in bowl, and brush over the top of the crust. Put the whole thing into the oven. Bake until the crust is golden brown and the filling is bubbling, about 30 minutes. Remove and let cool, on the baking sheet for 10 minutes or so before serving. If you've read this blog much, you'll know I prefer to make my own stocks. Vegetable stock has always seemed like a waste of vegetables, though. Meat broths makes sense. Just a few vegetables and some left-over bones, that I'd otherwise throw away, and a bunch of water. Very frugal. Using up a huge amount of yummy veggies only to toss them in the trash after I've boiled them to death just to make vegetable both? I don't think so. With that in mind, I've generally used the “Better-than-Bullion” vegetarian broth base in the past. (No, that is not an endorsement. It's just what I like and can easily get a hold of.) Not anymore. With the help of America's Test Kitchen, and some recipe tweaking to make it fit my budget and available vegetables, and still taste great, now I have an amazing recipe for my own vegetable broth base. Yes, it still uses a bunch of vegetable, but, I get a lot more yield from my grocery money than making traditional vegetable stock, or buying either kind at the store. This recipe will make about 1 3/4-cups of base, which translates to about 1 3/4-gallons of broth. Very cost effective, and much more flavorful. This recipe calls for kosher salt. Don't be tempted to cheap out and use table salt. It will ruin the broth base. Process the leeks, carrots, celery, parsley, minced onion, and kosher salt in a food processor until the whole turns into a fine past. You'll need to scrape down the sides of the processor bowl periodically, and will take about 3 or 4 minutes. Add the tomato past and process for 1 minute more, scraping down the sides of the processor bowl about every 20 seconds. Add the soy sauce and process for one more minute. Transfer the mixture into an airtight container and tap it firmly on the counter a few times to remove any air bubbles. Press a small piece of wax paper flush against the surface of the mixture (this helps prevent freezer burn and ice crystal formation) and cover tightly. Can be frozen for up to 6 months. To make one cup of broth, stir one Tbl of either fresh or frozen broth base mixture into one cup of boiling water. There will be veggie particles floating around, which I think add more flavor, but if you want a clear broth, steep the broth for 5 minutes, like tea, and then strain. What I do: I re-purpose a used, and cleaned, 16 ounce dairy container, like you find for cottage cheese or sour cream, along with it's lid. The broth base will fill it almost to the top. Then I cover the base, as described, with a square of wax paper so it touches the broth base, and trap the excess wax paper between the lid and the rim of the container. When I need some vegetable broth, I use a large tablespoon to scrape the frozen base off the top. I'll add it, just as if it were a spice mix, along with the needed about of water, when I make soups, or whatever I need a bit of vegetable broth for.